These days, I'm on the lookout for longer tops--sweaters, tunics and, yes, vests. Tops that end at the hips tend to accentuate the hips, the bottom and thighs. Who needs that? 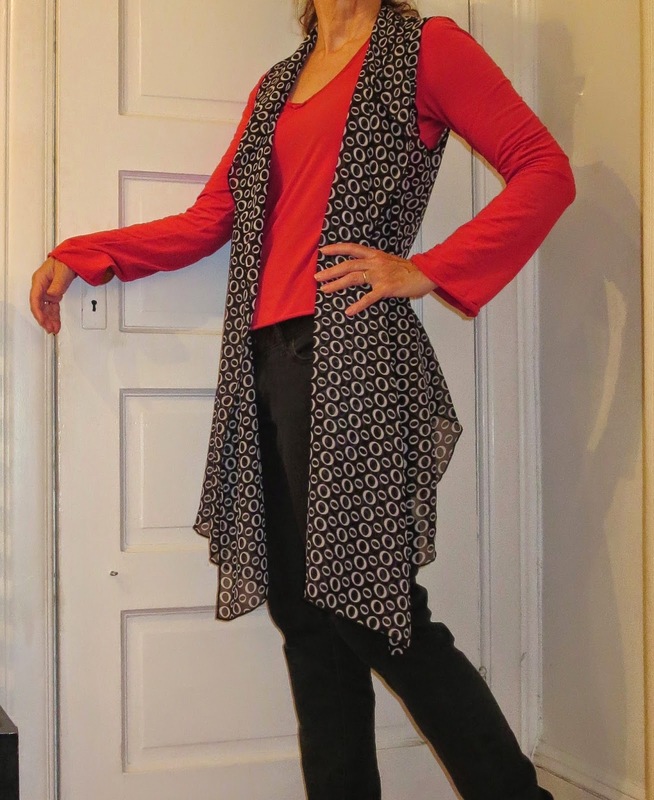 So...when Pauline Durban, founder of the clothing company Covered Perfectly, wrote to say she'd added a Cascading Vest (above) to her collection, I was excited. As the name suggests, the Cascading Vest is a draped piece that falls well below the hips, creating a flattering look for women over 50. Psst! Be sure to scroll down to the bottom of this post for a special Covered Perfectly offer for Flattering50 readers. Pauline invited me to choose one of her Cascading Vests to review for Flattering50. I chose one with a Black-White print. (The vest is also available in Brown-Leopard, Multi-Brown, and Zebra prints.) When I tried the vest on, I discovered that the polyester chiffon material flows beautiful from shoulder to hem, offering coverage without adding bulk. The material is super comfortable and feminine. Since it's summertime, I paired the vest with a black short-sleeve T and black jeans (above) for a casual weekend look. The black makes the vest pop, don't you think? I plan to also try it with a white top and bottom. Actually, I'm convinced this vest will look great with almost every top in my wardrobe. I love garments that give me lots of styling options. Depending on how it's styled, this vest will be a great "day-to-night" piece. That is, I can wear it to the office and later, for an evening out. Here's another photo of me wearing the vest with a red, long sleeve top. The versatility of this vest makes a perfect piece for transitioning from summer to fall. The Cascading Vest is available in two sizes: One or One-Plus. Like all the garments in the Covered Perfectly collection, the piece is well-made and well-priced at $39.95. Meanwhile...If you haven't already, I highly recommend you take a peek at theCovered Perfectlywebsite. The clothing company offers a wide range of comfortable, feminine tops in sizes S-XL as well as Plus sizes. In addition, the site's Customer's Gallery features real women wearing the clothing company's designs. It's a great way for shoppers to see what the various garments look like on women, some of whom are over 50, like you and me. Flattering 50 readers can receive 20% off. Just use the code F50 at checkout at Covered Perfectly. Please note: This offer cannot be combined with other offers on the site.